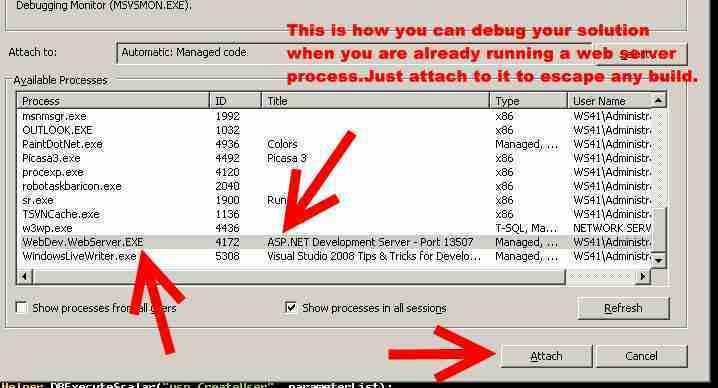 Simply choose your web server process to attach and you will see without building your entire solution your solution has been attached to the debugger. Believe me i use it in my day to day coding and it makes development process 100K faster. 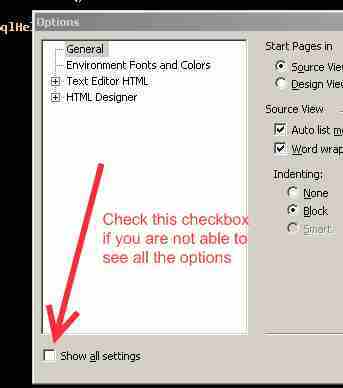 1.This post links to a tip used to decrease the load time of the IDE by disabling the splash screen. I knew some of them but the list is more complete now. The quality of those images is just awful. Use PNG instead of JPG for this kind of thing. Most of those points are indeed valid, but the IDE's shortcut system for text editing is rather dire. It's a poor effort at the likes of VIM and emacs. I hope in future releases of VS that they build some proper editing facilities (such as VIM emulation) directly into the core. Nice post, but please use PNG for your screenshots in the future. These features work in VS2005 too. Yes i will definately switch to png's next time i was just experimenting with google picasa web albums and they use jpegs in order to reduce the size of these i messed with the quality but listening to all your suggestions i will definately use png's and some other hosting service. Re: Most of those points are indeed valid, but the IDE's shortcut system for text editing is rather dire. The Visual Studio IDE supports full remapping of the keyboard and has a complete macro system. I haven't found anything yet that I cannot do, and my VS environment is highly keyboard-automated. Between Intellisense and macros, I rarely have to press more than a few keys to get anything done. 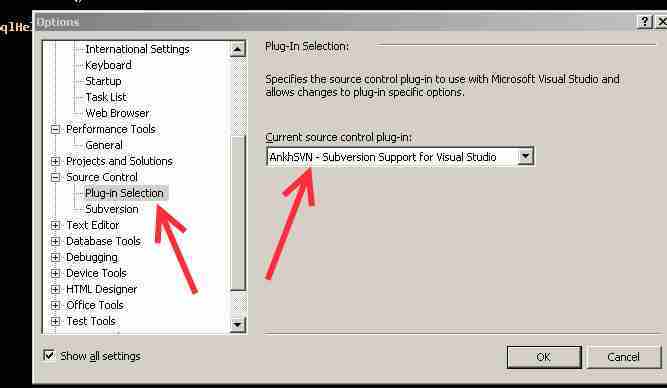 Visual Studio may not be exactly what you need out-of-the-box, but you can conform it to your exact needs with just a little work. It's worth the effort if you spend all day in the IDE like I do. Just to note that if you press ctrl+c or ctrl+x at any part of a line it copies/cuts the entire line. Doesn't have to be at the begining. Hey Peter thanks for reminding that it was my mistake while writing. Thanks Ajay for your valuable comment.Ya for sure i will keep on posting and there are yet many posts to come. 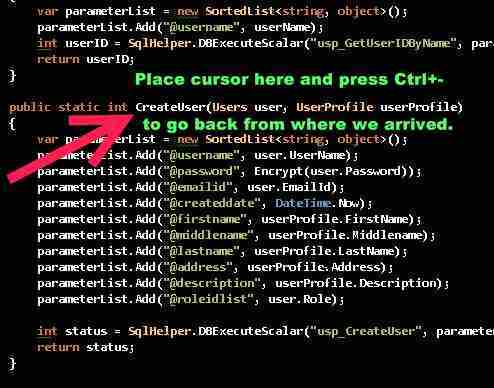 This is very help full article for new user and other who do not know all shortcut related to dot net. for full screen mode shortcut is Ctrl+ Alt+Enter not Ctrl+Shift+Enter. >>"for full screen mode shortcut is Ctrl+ >>Alt+Enter not Ctrl+Shift+Enter. >>By the way good copy :D"
Hey man i have written Alt+Shift+Enter for the full screen mode and it perfectly works fine for me. I's looking for this:- "Expanding and Collapsing the code units". Thanks for suggesting those i am doing another post on these shortcuts and tricks i will definately include them there. While writing this post i thought of putting only those shortcuts which are not so commonly used but can be a great time saver.But now in my other post i will publish simple but useful shortcuts also which will include all. A window will come up to confirm the auto-generated public name... confirm, and the system generates the get/sets for you. You can really bang out properties quickly with this shortcut. really nice post. this helped me a lot. 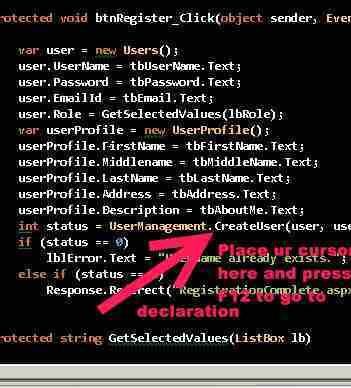 Thanks for that, good work..
type the variable name eg private string _foo. Hit ctrl R, ctrl E . This will generate the property for u. Thanks this is a nice list. Just wanted to Add to point number 3 above. Ctrl + M + P : Expands all outlining. Basically reverse of (Ctrl + M + M). The tricks are handy but way of presenting them can be a further refined. I was looking for Line copy & paste, expand & collapse. CTRL+M+O = Awesome!! Cheers for that! Awesome .. Cheat sheet for these shortcuts? when using ctrl+shift+f, it's handy to use f8/shift+f8 to iterate through results back and forth. 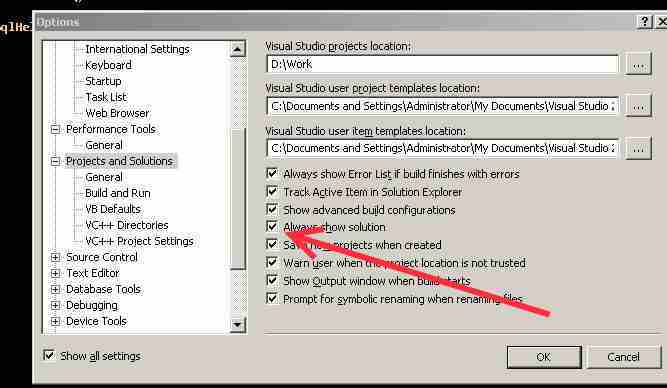 For deleting a line in Visual Studio just place the cursor on it and press Ctrl+Shift+L (OR)Shift + del. Great. I am sure, I will tweet this to my twitter account. This will help a lot of users.